At Kenwick Park we firmly believe that Junior Golf is a vital component of a successful golf club. This is why we invest our time heavily to ensure any junior receives the very best in coaching and support. The club achieved the Golfmark Award in 2010 and in 2013 was awarded "High Acheiver" having met high standards in Coaching & Playing, Club Administration (including sports equity & ethics), and Child Protection & Duty of Care. Kenwick Park has the necessary facilities in place to ensure the safety of all children that we coach and the opportunity to offer youngsters everything they need to get the maximum enjoyment from the game of golf. Despite the golf club being only 26 years old we have a rich history of developing junior golfers. This started when Eric Sharp was the Head Professional. Eric has coached players to various European Tour successes and a Ryder Cup team member. Paul Spence has been tasked with taking up the mantle left by Eric Sharp and he is making a fine job of it. With Ashton Turner (Ranked #1 Under 18 golfer in Europe, July 2013) and Jessica Schiele who competed with distinction on the US Collegiate scene to name just a few. Paul is also coaching our next crop of budding junior golfers with the help Assistant Golf Professional Lee Cardy and PGA Level 2 Coach Nik Fox. We are not necessarily looking for the next Tiger Woods but what we take great pride in is bringing youngsters into the game that want to play golf, enjoy golf and uphold the traditions of the game. Golf is not only a great game for fitness, achieving personal goals and building friendships but it also gives youngsters a great start in life and the opportunity to mix with others from many different backgrounds. A Junior membership at Kenwick Park comes with many additional benefits. We organise Junior Golf Clinics in the school holidays and coaching every other Saturday afternoon for our junior members at no extra cost. We have a Junior Team that competes in the local Lincolnshire League and juniors who achieve a handicap of 28 for boys, 36 for girls or better are eligible to play in the Mens and Ladies competitions. Help and advice is never far away, if you would like any more information about Junior Membership please contact Michael Langford on 01507 605134. Our Junior Captain for 2019 is Nathan Price. 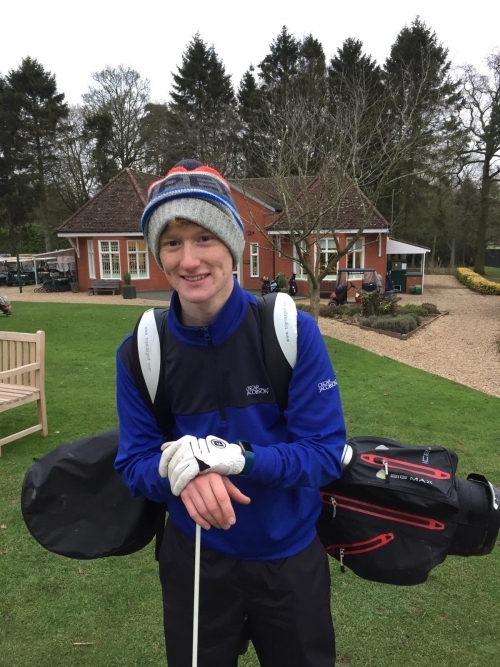 Nathan has been a junior member here for a number of years and has enjoyed many memorable moments on the golf course. His Handicap is 13 and last year won the Kenwick Park Mixed Salvers. Nathan is currently a 6th Former at Queen Elizabeth's school in Alford studying Business Studies amongst other subjects. Not a member, no problem!! We run Beginner Group Coaching groups every Saturday. Our undercover Driving Range and 9 Hole pitch and putt course ensure there is always something new and exciting to try in the sessions! The concept is based around a fun learning environment to gently introduce youngsters into this wonderful game. The cost is just £4 for the hour, if you require any further information please contact 01507 607161 to find out more!